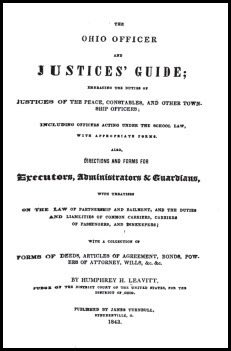 The Legal Genealogist loves legal treatises. Okay, admittedly, The Legal Genealogist is also a law geek, so the idea of being in love with “a systematic exposition or argument in writing including a methodical discussion of the facts and principles involved and conclusions reached”1 — when that treatise focuses on a legal topic — is hardly remarkable. But treatises have two very big pluses going for them when it comes to genealogy. First, because these are usually scholarly and/or practical explanations of an area of the law written for lawyers or judges (or both) by a lawyer or a judge (or both), they usually provide a pretty good and reasonably reliable grounding in an area of the law that we often know nothing about and in which we need a basic education. And, second, at least with respect to treatises written and published before 1923 — the key break-point for American copyright protection2 — they’re often digitized and readily available online. No question that he had the qualifications to educate us all about these early officials and their tasks! So… where and how do we find these treatises? And to find a particular treatise, we need to put on our thinking caps and consider how to construct a search that will get us to what we need. My typical search system is topic + location + time frame. So, for example, in looking for information about justices of the peace in Ohio in the years just after Ohio became a state, my search terms might be justice of the peace Ohio and a date range. And where a search turns up just too many options, I’ll add the word treatise to the search term to see if that will narrow things down. So the next time you need to know about a specific legal concept to figure out what your ancestor was doing — maybe he was serving as a justice of the peace, or maybe appearing as a defendant in front of one! — check out the treatises for the time and place. It’s a great way to get an overall education in the topic.